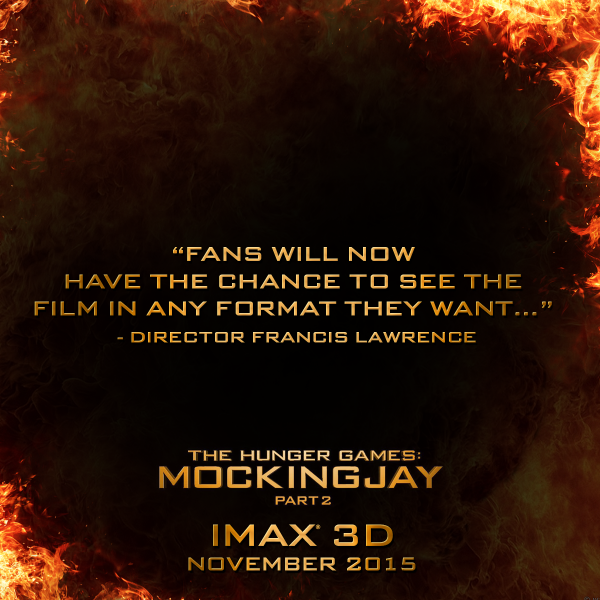 "I'm thrilled Mockingjay – Part 2 will be in IMAX theaters," said director Francis Lawrence. "Fans will now have the chance to see the film in any format they want, which is exciting; we recently saw the 3-D version of Mockingjay – Part 1 before its release in China, and the new level of immersion was really fantastic." "It's exciting to be back in The Hunger Games world and once again team up with our partners at Lionsgate, director Francis Lawrencea nd producers Nina Jacobson and Jon Kilik on what we believe will be a thrilling, action-packed finale to this blockbuster franchise," said Greg Foster, Senior Executive Vice President, IMAX Corp. and CEO of IMAX Entertainment. "The fan enthusiasm and cultural impact that this series has generated has been truly remarkable and we are thrilled to offer audiences the opportunity to experience the last chapter in IMAX 3D." Lionsgate CEO Jon Feltheimer confirmed during the call that the film will release theatrically in 'all formats' - 2D, 3D and IMAX 3D - in all territories worldwide the week of November 20. RealD 3D also put out a press release announcing the global regular 3D rollout for the film. Stay tuned for more as it comes in.